Dozens More Murdered In Mexico; Count Of Headless Bodies May Near 70 : The Two-Way Early reports put the death toll from the latest drug violence at 49. But the numbers of victims may even higher. Mutilated bodies were dumped on a highway. 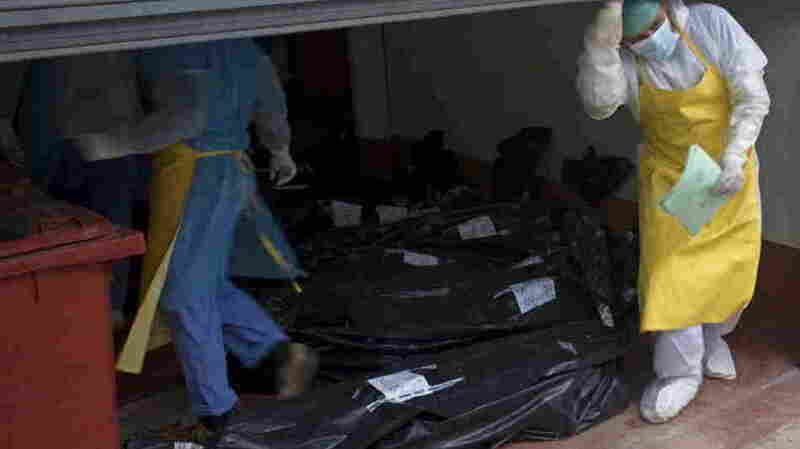 Morgue employees take in some of the bodies that were found Sunday. "49 Headless Bodies Dumped In Mexican Town." But the news may be even more gruesome. According to El Blog del Narco, which as Eyder has reported previously follows the drug violence in graphic detail, there may be as many as 68 victims in this latest atrocity apparently related to Mexico's drug wars. As the Los Angeles Times says, "the exact number of dead [is] being sorted out, made unclear by the condition of the bodies." "San Juan, a town in the municipality of Cadereyta, about 105 miles west-southwest of McAllen, Texas, and 75 miles southwest of the Roma, Texas, border crossing, state Attorney General Adrian de la Garza said." "At the spot where authorities discovered the bodies ... a white stone arch that normally welcomes visitors to the town was spray-painted with '100% Zeta' in black letters an apparent reference to the fearsome Zetas drug cartel that was founded by deserters from the Mexican army's special forces." As the AP also notes, "drug violence has killed more than 47,500 people" in Mexico over the past six years.